This weekend is chock-a-block with road closures, so when it comes to getting around the city, it's time to get creative. 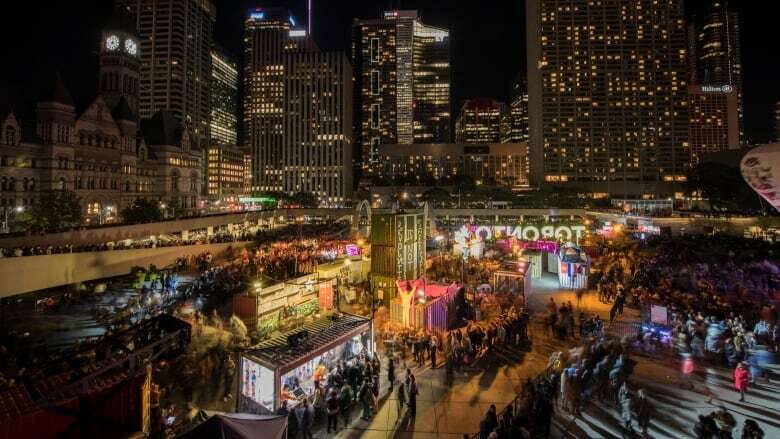 As all-night art event Nuit Blanche prepares to take over parts of Toronto this weekend, road users should prepare to get creative as they plan their routes around town. Queen Street West between Yonge Street and University Avenue, from 4 p.m. Saturday to 9 a.m. Sunday. York Street between Queen Street West and Richmond Street West from 4 p.m. Saturday to 9 a.m. Sunday. Bay Street between Dundas Street West and Adelaide Street West from 8 a.m. Saturday to 11 a.m. Sunday. For the Scarborough component of Nuit Blanche, avoid Borough Drive, which will be closed between Brian Harrison Way and Town Centre Court from 8 a.m. Saturday to 9 a.m. Sunday. Consider leaving the car at home altogether — the TTC will run subway service for all of Saturday night to help art lovers get around town. Some bus and streetcar routes will be affected by Nuit Blanche street closures. You can find the complete list here. On Sunday, the CIBC Run for the Cure will also impact travel in Toronto, shutting down the area bounded by University Avenue, Bloor Street West, St. George Street, and Queen Street West between 7 a.m. and 1 p.m. Nearby Grosvenor Street between Queen's Park Crescent and Surrey Place will also be closed on Sunday between noon and 3 p.m. for the Ontario Firefighters Memorial.